The Laserfiche Digital Transformation Model is a roadmap to transforming your office into a digital workplace, providing a structured framework for the purpose of digitising, analysis, process automation and much more. Phase five is about eliminating ineffectiveness. All of your departments should have eliminated paper by now and content should be secured, while still allowing easy access to those who need it. * Processes are not always aligned with business needs. * Pivoting in response to change is difficult and costly. * Your ability to plan for the future is limited. * Your organisation is reactive and not proactive. In the past, organisations have relied heavily on anecdotal information when improving processes, but the data gathered from automated workflows enables an organisation to accurately and granularly examine how people are interacting with documents and data within the organisation. Analysis of this data is called descriptive analysis, as it describes what has occurred in the past, facilitating an informed response. Descriptive analysis can reveal unnecessary activities, uncover bottlenecks and help managers identify dominant activities that take the most time and effort in a process; all information that managers can leverage to reform and improve processes. Put simply: descriptive analytics provide managers with quantifiable information to improve performance, such as an average number of cases processed per worker per day or even per hour. While descriptive analytics provides knowledge workers with valuable insight, advanced analytics can go even further. Building on descriptive data analysis, predictive analysis examines processes at a macro level, detecting healthy or unhealthy patterns in workflow based on what has occurred in the past. From these data patterns, advanced analytics helps in forecasting normal timeframes for processes and activities. So if you land that big contract, you could now predict the impact of the additional workload across departments and decide how to react accordingly. Interactivity with live data, both structured and unstructured, provides a comprehensive view of operations. Using structured data, advanced analytics can predict probable occurrences with unstructured data; advanced analytics also provides insight into causation. An organisation that is analytically savvy can plan and build processes more proactively, creating an agile environment, resources can be shifted to quickly respond to trends or changes in the market. Business leaders can ask complex questions about processes, create what-if scenarios and evaluate possible outcomes without affecting live processes and waiting for the results of their changes. * Financial service institutions can analyse activities to mitigate risk. * Government agencies can geographically pinpoint usage of public services to determine where to launch strategic programs. * Colleges and universities can track student performance and activities to implement interventions and prevent dropout. * Manufacturers can anticipate machine failures and perform preventative maintenance to increase production equipment uptime. * Oil and gas companies can better manage limited resources by streamlining oil distribution to make it more efficient and cost-effective. * Transportation and logistics organisations can make routes more efficient to increase profitability. * Marketing and sales organisations can capture and analyse data to personalise shopping experiences. 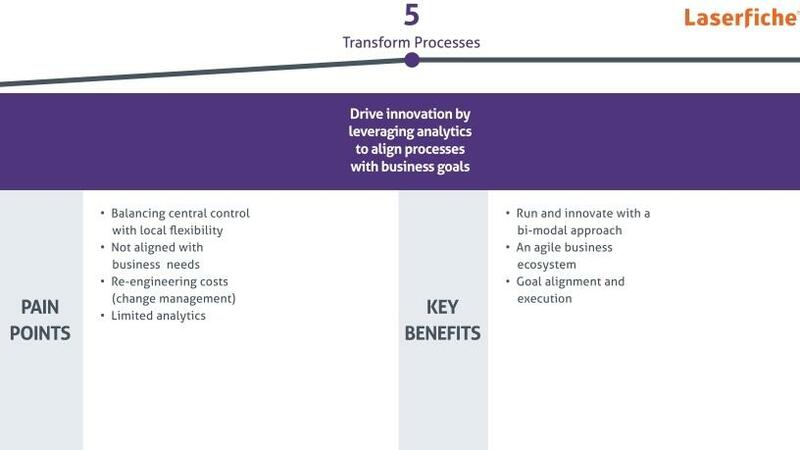 Achieving business maturity and leveraging advanced analytics requires planning, commitment and collaboration from all the organisation's content users, as well as IT and business leaders. This method will result in a robust, scalable and impactful analytics programme that will ultimately enable users to engage effectively with their organisation's data in real-time and use this information to drive business initiatives. To find out how Laserfiche can help you and in which phase of the DTM your business is in, please click here for a free online assessment.